Gabon-France: Ali Bongo’s visit to help restore France’s image? Newly elected Gabonese President, Ali Bongo Ondimba, will be on an official visit to France, Friday, and will be conferring wih French President, Nicolas Sarkozy. The two are expected to review relations between the two countries. The visit is essential to restore the image of France among disgruntled Gabonese, who have accused France of a murky France-Afrique collaboration, among other subjects. Ali Bongo Ondimba will meet his French counterpart, Nicolas Sarkozy, Friday in the framework of an official visit, his first trip abroad since he was declared president of Gabon. The newly elected Gabonese President will reveal his new vision of French-Gabonese relations, with respect to his so called “emergence” policies. the two are also epected to discuss “future bilateral relations”, as well as climate change, ahead of the “2009 United Nations Climate Change Conference in Copenhagen”, read a press release from the French administration. The two heads of state will also evoke the entry of Gabon into the United Nations Security Council. According to the French right wing newspaper, Le Figaro, Libreville cannot do without its “patron”, France, which is also an international advocate among donor countries for the Gabonese economy. The visit to France is, reportedly, essential to restore the image of france among disgruntled Gabonese who accused France of a murky “France-Afrique” collaboration with their country. The height of Gabonese peevishness was reached during Omar Bongo Ondimba’s funeral during which Nicolas Sarkozy was booed, while calm returned when the crowd went silent in an apparent respect for the Chinese representation. 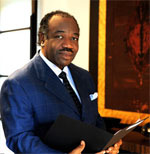 A couple of months later, during the Gabonese presidential elections, the opposition accused Paris of supporting Ali Bongo Ondimba, who stood as the presidential candidate for his late father’s party. Election results were later contested by the various candidates who run for president. Ali Bongo Ondimba begins his visit to France today, Thursday. Before his visit to France, the Gabonese President was in London where he participated in a conference organized by The Working Group on Greenhouse gases, which began Wednesday. The conference aims to tackle questions surrounding the interim funding needed to push for a reduction of greenhouse gases and their effects on tropical rain forests.